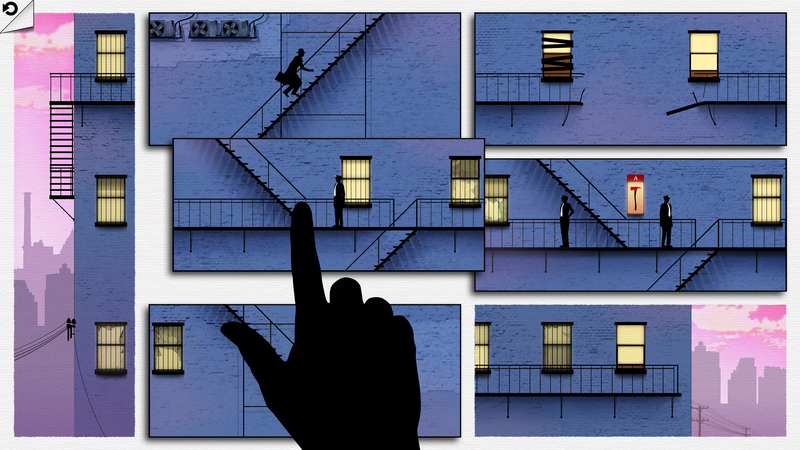 Christopher Huang’s Mustard, Music, and Murder is a less intricate construction than his previous, highly randomized detective puzzler An Act of Murder, but it’s likely to appeal to many of the same players. Mustard is a bite-sized mystery IF set after WWI, where the central challenge is to work out the alibis of various office workers who might have committed a murder. In the rather artificial mode of traditional logic puzzles, the characters turn out to have interacted in neatly quarter-hour chunks, so you need to interview everyone and then work out the resulting schedule to find out who could possibly have been alone at the right time. But as with An Act of Murder, realism isn’t precisely the point here. Instead, the game feels a bit like an early Lord Peter short, offering fifteen minutes’ worth of deduction in a cozy 1920s setting. The environment is implemented fairly lightly to avoid red herrings, but includes several entertaining surprises. Mustard, Music, and Murder includes a hint system that will step you through the solution if need be, so there’s no chance of being stuck, but I didn’t need to rely on that too heavily. Huang is also crowdfunding a novel about Peterkin, the game’s protagonist, and his fondness for this period and genre shine through. Meanwhile, though the spells may be ones we’ve mostly seen before, they’re generally being used on situations that we haven’t. The resulting puzzles do well (or at least, did for me) on the originality and explorability axes. Some take longer than others to work out, and for one or two I needed the hints; on the other hand, others are made easier because they have multiple solutions involving different spell combinations. To make the exploration more fun, Stelzer provides a number of good easter egg responses for using the spells in unusual places or unexpected ways. There are also a lot of nods to IF community figures and institutions, including what I take to be a reference to ClubFloyd and NightFloyd. In keeping with the Infocom originals, the author has provided invisiclues-style hints which you can highlight to view solutions; these are of course themselves full of misdirections and red herrings. At the same time, Scroll Thief sets itself apart from its predecessors and inspirations with an expanded role for NPCs, especially the Adventurer from Colossal Cave whom you can summon into your world. Your initial interactions with him are quite manipulative (and you really have no opportunity to make them otherwise), but later in the game it becomes possible to treat him more as an equal, someone you can talk to and do favors for. The bird and the snake from Colossal Cave get cameo appearances, and with judicious use of spells, you can get the bird’s insights into its situation. Then, too, the game’s setting gives more time and attention to the training of novices and the organization of the community of spellcasters, making it less a world of lone heroes and more a world of collaborative effort — a point that becomes particularly clear at the transition to Act II. The result is less lonely and more focused on interpersonal (or inter-creature) connection than the original games — in a lightweight way reminding me of the transition in Endless, Nameless from a puzzle-oriented model to one where NPC conversation is possible. The game’s story is not complete in itself. 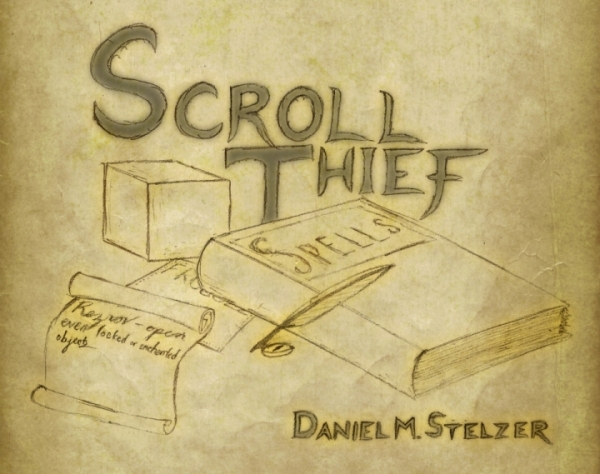 Scroll Thief contains two acts of a longer story, which promises to be a trilogy. The end of Act II introduces a mechanic from Spellbreaker which I would enjoy seeing explored further, so I look forward to the next chapter. Scroll Thief is certainly possible to play with only moderate knowledge of the source material, but I wouldn’t give it to someone as one of their first encounters with parser IF. Technically, this piece is doing some very challenging things — viewing from one room into another via magical scrying glasses, tying ropes to objects, ordering NPCs around from a distance, and other tasks that justly give parser IF authors pause. A huge amount of work has gone into making this complicated world model easy for the player to manipulate, and providing hints when some unusual bit of syntax is required. The world model works smoothly most of the time despite the difficulty of what it’s trying to accomplish. But the parsing involved in issuing commands and viewing things from a distance is still sometimes tricky to deal with. When scrying, for instance, LOOK IN SPHERE produces a disambiguation about what you want to look at while LOOK INTO SPHERE actually gives the desired room description of the thing on the other side. In other places, it can be necessary to run through several variant phrasings (ASK ADVENTURER ABOUT HELP vs ASK ADVENTURER FOR HELP, e.g.) in order to land on the one that will work. I ran into a few snags that meant I had to look for hints on puzzles I would otherwise have been able to solve on my own. However, Stelzer is releasing new updates rapidly, so it may be that these issues will be less of a concern in a couple of weeks. 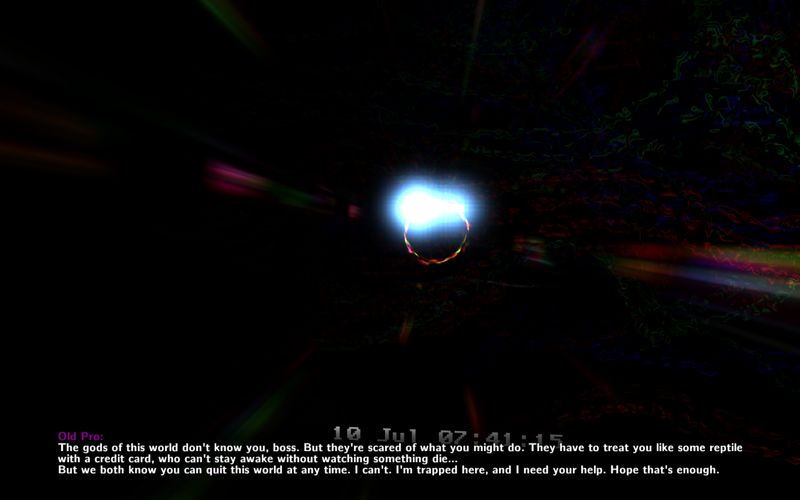 The Magic Circle is a first-person puzzle game that recently left Early Access for full release on Steam. The premise is that Ish Gilder, a game designer with a massive cult following, has been trying for decades to follow up on his early text adventure success. He’s been promising exotic features for the sequel with Molyneuxian abandon, and he’s held something like five separate crowdfunding campaigns, but the game never quite comes together. In fact, a nearly launch-ready version gets totally scrubbed at one point, a complete space-station setting buried in favor of something more fantasy-oriented. There’s a whole website dedicated to documenting the sad history of the game development. You play as a tester who has gotten access to this desperately broken thing, and you’re trying to get it to function for you. Early on you meet the Old Pro, a self-aware AI of the protagonist who has been waiting all these years for his game to be released so that he can get out into the world. (How exactly he came to be a self-aware AI is not deeply explored and neither are the ethics of releasing him.) You don’t have a sword because Ish has decided late in the process to remove combat, but you do have access to debug tools that allow you to meddle with the flags controlling NPC behavior. When you’ve learned about a skill from one NPC, you can apply it to others. You thus spend the bulk of the game play time — I’d estimate about four and a half hours for me — exploring both the space and the fantasy areas of the game, which are linked, and solving puzzles in order to get close enough to creatures to yank their skills out of their bodies. This is an elegantly designed puzzle space: consistent and comprehensible mechanics, lots of fun bits where you can combine different character skills to produce useful or funny or horrifying results, and a non-linear design that lets you tackle problems in the order of your choosing. It is possible to find solutions the devs didn’t specifically anticipate. I did once waste a lot of time trying to solve an enemy, the Securitron, because I hadn’t yet picked up the skills that would have made it easy to kill, but eventually I remembered that I had other options and went off to try something else first. Most of the time I was challenged enough to have to give situations a bit of thought or experimentation, but not all the way to stuck, which is what you want. Lots of nice work has also gone into making an easily navigable map with clear signs of where you will find new puzzles to solve, so you’re not wandering around this big space desperately looking for doors and triggers. So that’s fun. And while you’re doing it, you get a bunch of diary-page style storytelling in the form of change log notes and director’s commentary and other scattered text and audio clips, messages from the Old Pro, and the occasional scene of avatars interacting in-world. This is how you learn about Maze, the expert player who has come on to work for Ish as a designer, who loves high-difficulty gameplay and hate hate hates cut scenes; Coda, the long-time fan who has grown up waiting for Ish’s next game; references to Ish’s ex-wife and to other QA testers and designers who came and went over the years. From time to time you hear music, overlaid with instructions from the composer about what it’s supposed to sound like in this context. Eventually – but let’s have some spoiler space.